Our web is particularly interested in connecting experiences of business modellers who catalogue ( stock markets) aimed at attracting the world’s most purposeful organisations across generations of investment. I bring my father’s experience from The Economist and my own research of markets in hundreds of product categories and over 40 countries. In the 1990s my professional networks developed the standard organisational quiz of uniquely purposeful global organsations around the core question who would uniquely miss what if this organisational system did not exist. Anchoring purpose by ensuring ownership (in trust) of those of both longest and deepest need. When the origin of a system is through privatisation or other foundation/charitable monies, there can be no debate (I am aware of) that only the SB100 model is applicable. Similarly if all the work or the resources are local, I can see no valid argument for external ownership. However if the organisation could not have been founded without an invention (eg of new technology) it seems to me that there are cases where both founders and poorest have a valid interest in compounding growth and purpose. Moreover in a decade where sustainability depends on developing models whose exponential maths go way above zero sum, it could be that both poorest and inventors gain from the compound growth dynamic that begins at the SB51 level. 1843 James Wilson, fan of French Entrepreneurial school (born circa 1800) and Adam Smith’s 18th century Free market models founds The Economist as a social action paper designed to test the great and the good in severe and transparent debates over what systemic investments sustain human development. How Do Social Business Models get funded? my favourte new-to-me case was naandi- love the way that it is privatization the way my dad intended- basically naandi has a water solution franchise ; it then goes off to local government and says you need to give us land and resources to get the franchise up and running for this community after which it is sustained by postive cashfkow- when emanuel faber asked how many are you aiming to build in next 2? years - the response was 2000! Yesterday was World Water day and my recent visits to the field made me pause and think about the tremendous strides that have been made in parts of India to bring clean water to every village. Just last week, the Villgro fellows were in Hyderabad, visiting the rural water plants of Naandi and Byrraju Foundations. Both organizations have similar operations of establishing water filtration plants in rural villages, which provide clean water for consumption at a price of ~Rs. 2 per day for each family (assuming a consumption of 12L). 1. 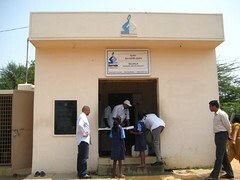 Instill practices to encourage usage of clean water – Naandi’s membership card has 30 slots for each day of the month. When households come to collect their water each day, the appropriate slot is marked off. Households pay Rs.60 for the monthly card of 30 days and cannot roll over any missed days. According to health studies, 12L is the amount that an average household needs to consume daily, so the objective here is to encourage households to consumer only clean water by forcing them to collect 12L per day or losing that option value. 2. Make it a water party - the water plant in Nellutla that we visited was a community center as much as it was a clean water source. The multiple taps and self-service model encouraged villagers to come in the mornings and evenings around the same time to commune as well as to collect their water. The plant was also located right by the village temple. The village also hosted parties around the water plant, since it was centrally located and was a natural gathering place. 3. 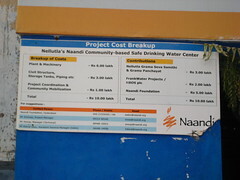 Increase transparency and accountability of the NGO – at the Nellutla water plant, there was a prominent plaque on the building displaying the donors who contributed to the building. But what was more remarkable was the display of the responsible parties and their contact information. The manager of Naandi’s water project was clearly listed along with his mobile number. Any time that the villagers had a problem with the plant, they knew who to call. It may sound simple, but it is truly impressive what Naandi and Byrraju have done in just the last few years. Naandi aims to be in 400 villages by the end of the year, which at an estimated 2,000 people per village could potentially impact 800K people! Both Naandi and Byrraju currently operate in Andhra Pradesh, which has one of the country’s greatest needs for clean water. The lessons learned there will certainly need to be brought to other states in India – there are still millions of people waiting for access to clean water. Which social and business model do your communities & next generation want to live with? Number 1 Job Creating Stimulus?